Dec. 12, 2013 9:00 a.m.
:Just in time for Christmas, a near life-size, handcrafted manger scene is located at the Cultural Centre. 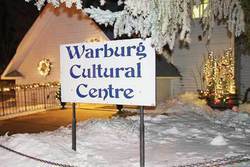 The delightful weather beckoned Warburg residents to the Community Park to enjoy a family friendly evening filled with carols, free hotdogs, hot chocolate and juice, street hockey and a big bonfire for visiting with neighbours for the the 7th Annual, “Light-Up” Warburg event on Friday, November 29, 2013. The event was sponsored by Warburg and District Recreation & Parks. Santa arrived via wagon pulled by a tractor—both decked out in the requisite “green and yellow” lights compliments of Martin Deerline. Residents then boarded the wagon for rides through the Village. Santa made sure each good little girl and boy received an advent calendar. Unfortunately, there were no gingerbread house contest participants this year. There is still time to participate in the Rec Board sponsored Community Light-Up Contest by decorating your home and yard. Contest judging will take place on December 14th. Three prizes will be awarded. Food and toy donations for the Christmas Elves program were accepted. A big thank to the Rec Board members, Village Council, FCSS, and the Village Administration and Staff who pitched in to make the evening a great success.